I am not the first person to compare fly fishing to golf. But after spending a day angling near Vail, Colorado, the parallels became clear. Golf and fly fishing are sports of persistence, one where dedication can yield big rewards. Being out in nature is as much of a draw as playing. And though both have become popular with the elite and wealthy—the gear one can buy for either is endless!—they remain, at their core, sports for the everyman. 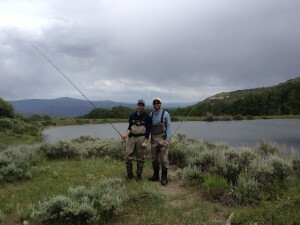 And, like golf, fishing in the Vail Valley is one of the region’s most popular summer pastimes. “The way I like to describe it to people is that we are a ski town that happens to have great fly fishing,” says Jeff Place, a former fly fishing guide and board member of the Colorado chapter of Trout Unlimited. The convenient Eagle, Colorado and Roaring Fork rivers all fish really well, says Place, as do the Black Lakes at the top of Vail Pass. And he points out that the Gore Creek, which runs right through Vail, happens to be labeled a “Gold Medal” trout stream by the Colorado Wildlife Commission. Vail is also host to the America Cup International Fly Fishing Tournament each September. Though walking, to the river or lake, is an essential part of fly fishing too, my guide opted to drive. But we rode in no golf cart. Instead we sat in the back of 85-horsepower Can Am ATV. And as we sped through the muddy Cottonwood Ranch in Gypsum, a 45-minute ride from my hotel in Vail, my preconceived ideas about fly fishing fell away. This was by no means the sport of quiet grandpas and boyish Brad Pitts. There was even Monster energy drinks available in the cooler. By the time we reached the picturesque lake that would be my classroom, mud covered my borrowed waders; it was time to start fishing. My guide, Alex Garnier, was a seasoned fly fisherman despite his youthful age and explained with great pride the basics of the sport. He taught me overhead and roll casts. I learned about dry flies and streamers. He implored the importance of the pause and why I should always keep the line tight. I learned that because angling the rod was so important to the sport, they name fly fisherman “anglers.” But above all he enforced the sport’s most important rule: patience. The latter lesson was maybe the hardest to learn. I have never been a patient person. I wanted badly to perfect my cast, almost as bad as I wanted to catch a fish. So when I struggled to garner a bite—let alone hook something—my patience waned. Our company on the lake—another guide, Anthony, and his 13-year-old prodigy, Web—had been catching trout all morning. I tried not to get jealous of my pre-pubescent competition while Alex did his best to adjust my technique and read what the fish were eating. I said I would be OK if I didn’t catch anything—after all it was my first outing—but, like landing in the sand trap, I knew I would be horribly embarrassed to admit defeat. With only an hour left before we had to return to my hotel, Alex suggested we try a different lake. There, I opted to stick with the classic dry fly, hoping to challenge both my patience and perfect my technique at the same time. And then it happened: my best cast of the day. My pauses were perfectly timed and my overhand cast jut deep into the lake. Upon contact with the water I felt a bite. Lifting the rod high above my head to create tension I saw the fish, wriggling on the end of my line. Summoning what poise I had left, I allowed the fish to come to me. I let out the line when it thrashed and pulled it in when it calmed. 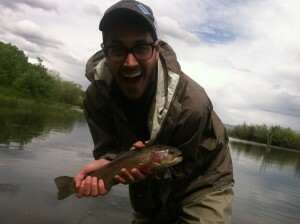 Alex scooped the beautiful hot-pink Rainbow Trout into his net and grabbed his camera. Benjamin with his first ever fly fishing catch. In that moment the rest of the day disappeared. There was only the catch. I grinned like a maniac as I held my first fish. I had done it all by myself and, like getting on the green with a perfect drive, the sport hooked me. Joy replaced all my frustration and I understood the sport’s universal appeal. Then I took a deep breath of fresh air, admired the mountains, and immediately got back to fishing. I wanted to do whatever I could to recapture that feeling again. And lucky for me, I did once more before the day was over. Benjamin Solomon is the winner of America’s Best Summer Job, a 10-week, all-expenses paid summer job exploring what summer in the Vail Valley has to offer. 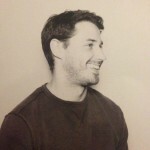 A freelance writer based in New York, Benjamin has contributed to publications such as Vanity Fair, New York, Travel + Leisure and is the former editor of Next Magazine. Follow his journey on Blog.Vail.com as well as on Twitter and Instagram using the hashtag #VailBen.